PowerPoint is the gold standard for those must-nail-it presentations, but it’s overkill for the informal meetings that make up the bulk of our workdays. Spending a couple of hours transferring your ideas and research notes into a showy slide deck for a 15-minute team huddle is just bad productivity. If you’re using Evernote to collect all your project- and other work-related material, you already have a better alternative at your fingertips. Evernote’s Presentation Mode allows you to transform your notes into full-screen presentation layouts in the time it takes your colleagues to get to the conference room. Here’s how to do it. 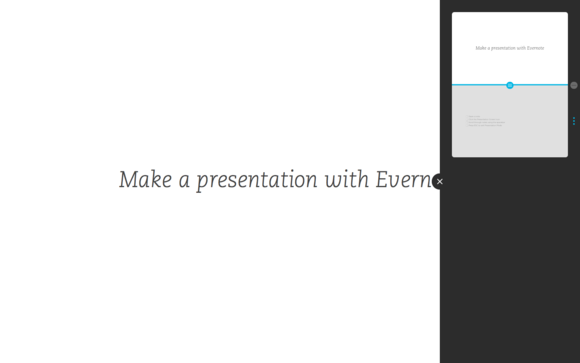 You can activate presentation mode from any note by clicking the presentation screen icon in its upper right corner. Doing this will expand the note to fill the display. Activate Presentation Mode by clicking the presentation icon (second from the left) in any slide. More often than not, you’ll want to present multiple notes as a presentation. To do that, Shift-Click each of the notes you want to walk through and click the Start Presentation button that appears in the note display window. In presentation mode, each of your selected notes effectively becomes a slide and you can scroll through them using your mouse, arrow keys or the space bar. To get out of Presentation Mode at any time, hit ESC. 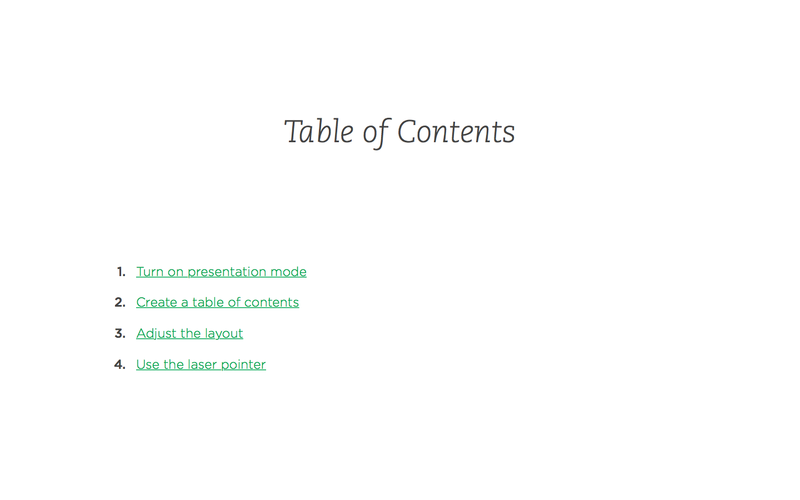 If you’re presenting a large selection of notes, consider using a table of contents for smoother navigation. Select your notes then click Create a Table of Contents. 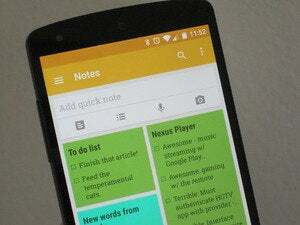 This adds a new note with links to all of your selected notes. Now you have an outline of your presentation from which you can jump straight to each note as necessary. 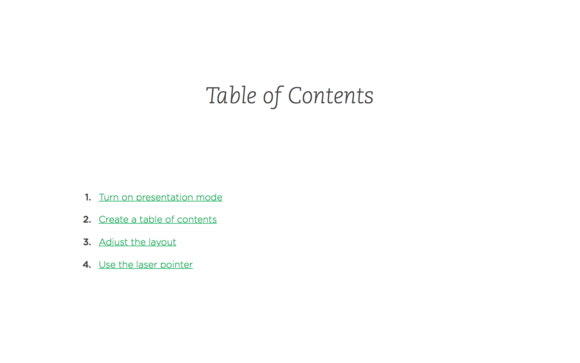 Create a table of contents to link to each note in your presentation. 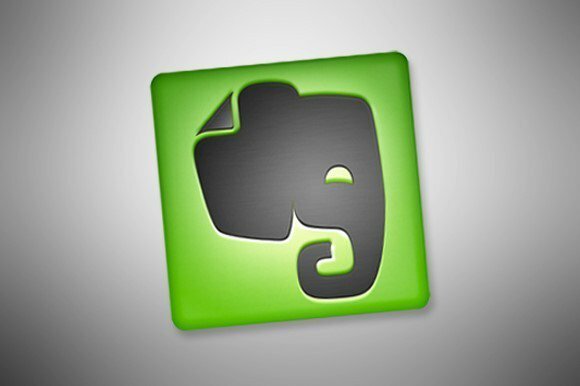 By default, Evernote presents each note as one long, scrollable slide. That’s fine if the note only has a few bullet points, but if it has more information than that or you want more control over how to display the note's contents, say to place more emphasis on a particular point, you can adjust the layout to display a single note in multiple, smaller sections. In the layout tray you can split a note into sections that display separately. 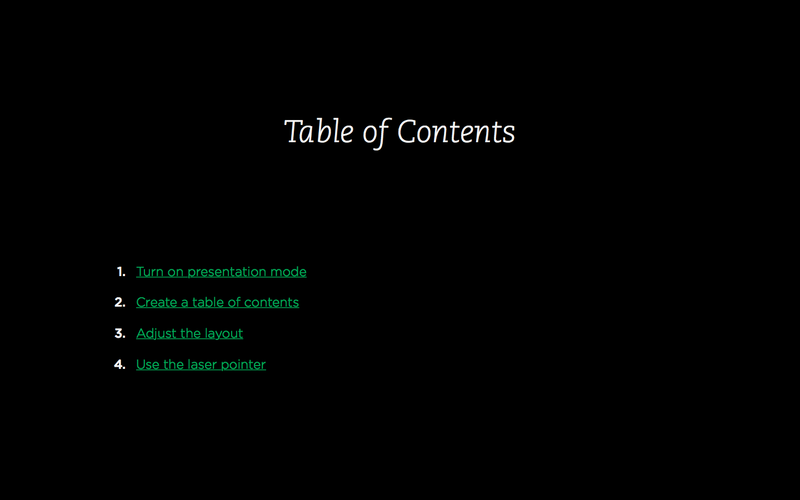 To do this, turn on Presentation Mode, hover your mouse in the upper right corner of the slide you want divide, and click the Presentation Layout icon. The layout editor tray will slide out, showing a thumbnail of your note with a series of blue dots adjacent to it. Each dot indicates where you can insert a screen break. To add a break, hover over one of the dots and click the '+' sign that appears. A blue line will be inserted in your note to mark the break point. To remove a break, hover over the corresponding dot and click the minus sign. Try leading your audience through a note with your mouse cursor, and you risk losing them as soon as you start. Fortunately, Presentation Mode transforms your cursor into a laser pointer with a fading trail, to help you keep their focus where you want it. To access the pointer colors—blue, pink, and green — hover over the gear icon in the upper right corner of any slide or type CTRL-P. 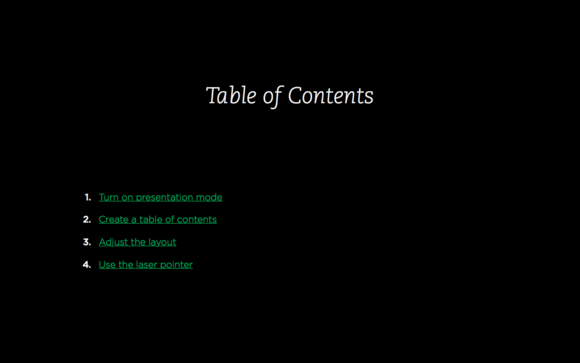 Presentation Mode displays your notes as black text on a white background, but for low-light environments you can reverse the colors by switching to Night mode. Just hover over gear button in the upper right corner of the slide and toggle the button from the sun to the moon icon. 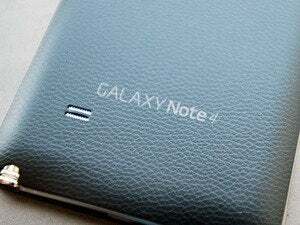 Night mode reverses the note colors for easier viewing in low-light environments. We can’t guarantee you or you coworkers will ever look forward to meetings, but if you use this trick we’re pretty sure you’ll never dread one again.